What is the relationship between borders and knowledge? How do changes in territorial and social borders affect knowledge’s epistemic boundaries; how do changed knowledge boundaries affect physical borders? Which is more resilient; which seems to change most easily? These are the questions addressed by the fourteen chapters in this volume. The volume uses case studies, based on both historical and contemporary sources, to highlight processes of knowledge production within the social sciences and humanities. Our focus is on Middle Eastern societies and peoples – Circassian, Assyrian, Turkish, Arab, Kurdish… – living around or having moved north from the Mediterranean. One central subject is the influence of migration and travel on the relationship between the geographic and linguistic borders established by nation-builders, and those constructed by scholars, travellers and commentators. A second is the transfer and translation of textual elements of knowledge – e.g., cultural repertoires or historical narratives – from one linguistic social setting to another. 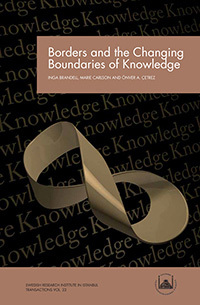 Together with an introductory discussion of the book’s three border-knowledge themes, the studies present new theoretical and methodological conceptualisations of the intriguing and manifold relationship between physical, social borders, and the boundaries of knowledge. Inga Brandell is professor of political science at University of Oslo and senior professor at Södertörn University. Marie Carlson is associate professor of sociology at the Department of Sociology and Work Science at University of Gothenburg. Önver A. Çetrez is assistant professor in psychology of religion, at the Faculty of Theology, Uppsala University.